I don't usually share very many personal things on this blog. It's an art/crafts/sewing/upcycle/preschool/kids' activities blog more than a blog about my family. The purpose of all those arts and crafts, sewing, home preschool, etc, though is to create a warm, loving comfortable home for my family, on a budget where I can be home with my kids. I did want to share my all-time favorite project with you. Not only because it turned out beautiful, but because of what it symbolizes and the personal meaning behind it. This is my Temple Quilt. I'm a member of the Church of Jesus Christ of Latter-day Saints (or Mormon Church). In our faith, we believe that the family unit is eternal and that we will continue to live as families after we die. We believe that marriages sealed in the temple do not end at "death do us part," but rather continue into the eternities, if we live worthy and Christ-like lives and live up to the covenants we've made with God. After our oldest two children were adopted, we were able to take them to the temple as well and have them sealed to our family for eternity. If you would like to know more about the purpose of temples in the LDS faith, there is a good article here. When I look at this quilt, it reminds me of the peace I feel when I go to the temple. It reminds me I should attend the temple more often to feel that peace. It reminds me to be more patient, kind, loving, with my family. It reminds me to be more Christ-like. It reminds me that there are things that are far more important than many of the things that tend to clutter up our lives. This quilt teaches my children that the temple is important enough to me that I spent hours making a beautiful quilt for our home and then displayed it in a prominent place in our home (over the organ because it won't fit over the mantel). I hope that as they grow up seeing it, it will help them feel that the temple is important in their lives. 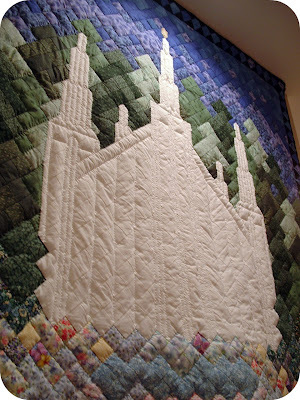 The particular temple I used in the quilt is the Portland Temple where Hubby and I were married over 10 years ago. There are temples all over the world and many have visitors' centers where you can learn more about them. Now before you go wondering where I had the time to make this with little kiddos running around...I didn't have the kiddos at the time. 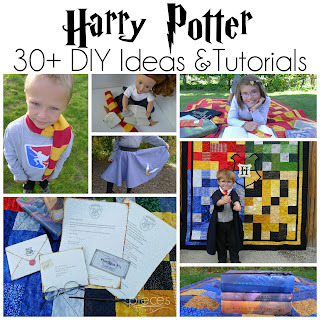 (I used to make a lot more quilts before the kiddos.) I made it long before we had kids, back when I was teaching high school and had the summer off. This took up our living room for at least a month where I had all the little squares laid out in their places. I drew up the outline of the temple on graph paper and then just played around with the placement of all the other squares until I liked the look of the background. 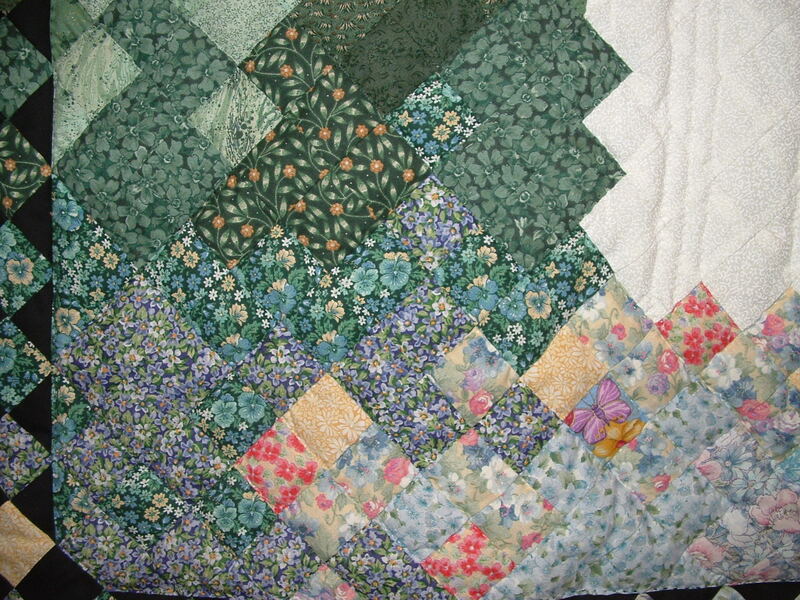 All of the squares in the quilt are the same size, although some squares were pieced with triangles first. I'd checked out a book about Impressionist Quilts from the library (I think it was this one...but it's been a long time, so I'm not positive). My quilt wouldn't quite fit the definition of the ones in the book because the temple stands out so much with hard lines, but the landscape was inspired by the ideas in the book. Polly, this a beautiful quilt! what a wonderful thing to have on display for your home. I love your amazing quilt. I think your math skills were a big help in creating this artwork for your home! This is absolutely beautiful & amazing! I'm so glad you decided to share it. 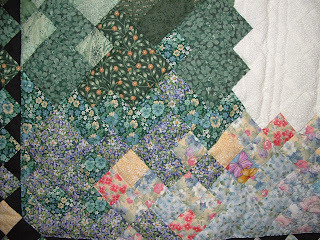 I've been bitting by the quilting bug lately & this is such an inspiration. beautiful! I was married in the Portland Temple too. :) Just discovered your blog through Dollar Store Crafts and I'll be visiting regularly. that is an amazing quilt. i really want to make one like that. thanks for sharing your talent! 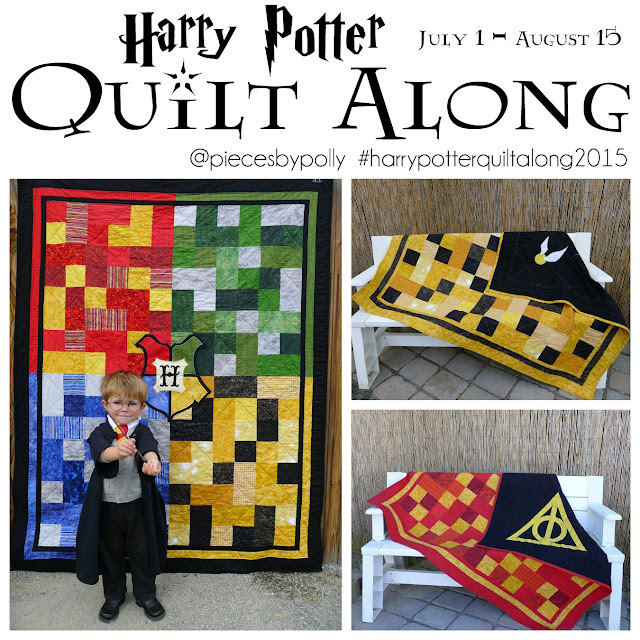 this is an amazing quilt! I really want to try and make it now. thanks for sharing your talent! This is amazing! 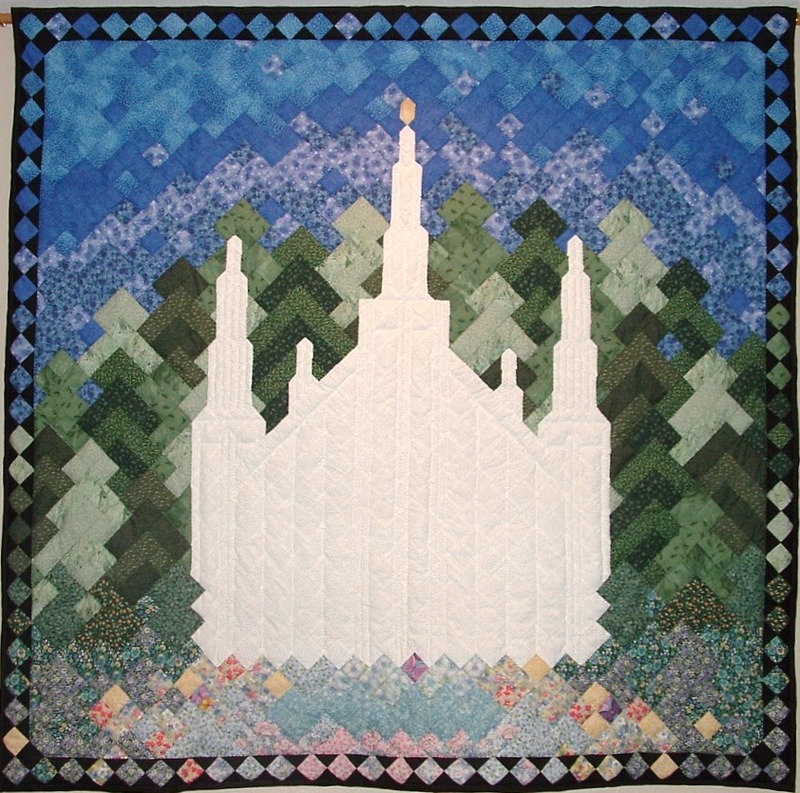 My oldest is turning 8 in a little over a year and I was thinking it would be wonderful to make her a quilt for her baptism with the temple on it so I came online looking for ideas. This is so beautiful and is such an inspiration! Thank you for sharing!